Or easy to convert back to single family, with a basement nanny/in-law suite option, i n a prime school catchement! Situated in a superb central downtown location in the "Upper Annex" nearby Casa Loma, U of T, Yorkville & Wychwood Barns ! 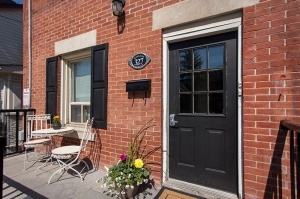 Very family oriented 'hood - convenient walkto the Dupont subway station , great shops, restaurants, schools and parks. Potential to create a sweet grassy yard area. Terrific tall ceilings on main floor. Hardwood floors on main and 2nd floor. Easily create basement apartment (has separate walk-out & 3 piece bathroom) or just enjoy the beauty of having that extra space for a nanny's suite/visiting relatives/teenager haven. Quiet upper Annex pocket proudly known as the vibrant Tarragon Village! Tight well-knit cohesive community is home to many families of successful business people, prominent artists, community leaders and University of Toronto faculty who enjoy its diversity. Great relationship with responsive city councillor! Special private street festival each year! Popular Hillcrest P.S., Brown P.S. (French Immersion), Winona Dr Sr P.S. nearby Loretto College School, Royal St. Georges College, University of Toronto, George Brown College. One block over on Albany is the wonderful Cawthra playground park for all the neighbourhood kids, or Jean Sibelius, Bill Bolton skating rink & hockey league, Vermont Square & Christie Pits. Unique proximity to art, culture, sporting venues including Wychwood Barns, U of T Athletic Centre, Casa Loma, The Jewish Community Centre, The Native Canadian Centre of Toronto, Royal Ontario Museum, Royal Conservatory's new Koerner Hall, Spadina Road Public Library, Annex Dance Academy, St. Alban's Boy's & Girls Club, to name but a few! Enjoy the diverse calendar of shows at the famous Tarragon Theatre! Many great local restaurants like Fanny Chadwick's, Corner House, Dos Amigos, Indian Rice Factory plus a mix of restaurants, delightful shops & boutiques, and specialty stores along Bloor and desirable restaurants/bars a short walk away at Dupont/Spadina/Bathurst. Specialty stores along Bloor and desirable restaurants/bars a short walk away at Dupont/Spadina/Bathurst. For every day needs - close by Loblaws, LCBO, Shoppers Drug Mart & Tim Horton's as well as Wychwood Barns farmers market. GO Green! Well served by public transit. Subway stations at Spadina and at Bathurst on the Bloor Danforth line, and at Dupont Street, on the Yonge-University-Spadina line. Conveniently located to get uptown or downtown in mere minutes!